Timers/counters are an independent unit inside AVR. They run independently of what task CPU is performing. In this post we’ll explore the TIMER 0 Interrupts of AVR ATMEGA 16 .The previous post was on External Interrupts , this TIMER 0 is Internal Interrupt. AVR ATMEGA 16 has 3 timers TIMER0 ,TIMER 1 & TIMER 2.Of these TIMER 1 is 16 bit Timer while others are 8 bit timers. Similarly a 16 bit timer is capable of counting 2^16=65536 steps from 0 to 65535. Due to this feature, timers are also known as counters. When the timer returns to its initial value of zero , We say that the timer/counter overflows. Timer 0 is a 8 bit timer. It basically means it can count from 0 to 2^8 255. The operation of timer 0 is straight forward. The TCNT0 register hold the timer Count and it is incremented on every timer “tick”. If the timer is turned on it ticks from 0 to 255 and overflows. If it does so, a Timer OverFlow Flag (TOV) is set. The Flags are present inside the Register TIFR which is common for all 3 timers. Another interesting feature is that a value can be set in the Output Compare Register (OCR0), and whenever TCNT0 reaches that value, the Output Compare Flag (OCF0) flag is Set. In this post we handle these above 2 events using the Interrupt concept. You can read from or write to this register to set your own time. 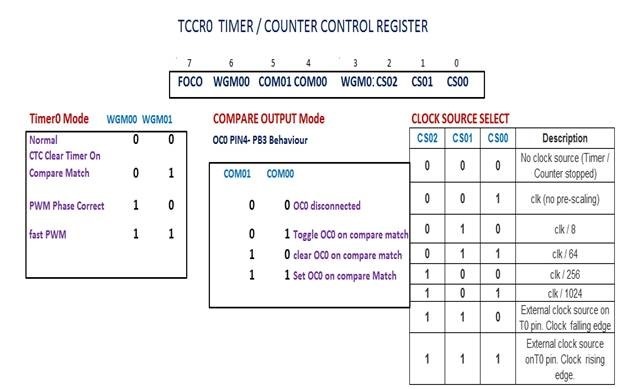 Timer0 works by incrementing this TCNT0a counter variable, also known as a counter register. The counter register can count to a value 0XFF , as Timer 0 is 8 bit . The timer increments this counter one step at a time until it reaches its maximum value (255), at which point the counter overflows, and resets back to zero. The timer sets a flag (OVF0) bit . You can check this flag inside TIFR register manually, or you can also have the timer trigger an interrupt (TOIE0) as soon as the flag is set. An Interrupt Service Routine (ISR) is called automatically to run code of your choice when the timer overflows. Timer0 counter has to overflow 31250 times to generate one sec delay. 1. Initialize TNCNT0 to value 0. 2. Program Prescaler by setting CS bits of TCCR0. 3. 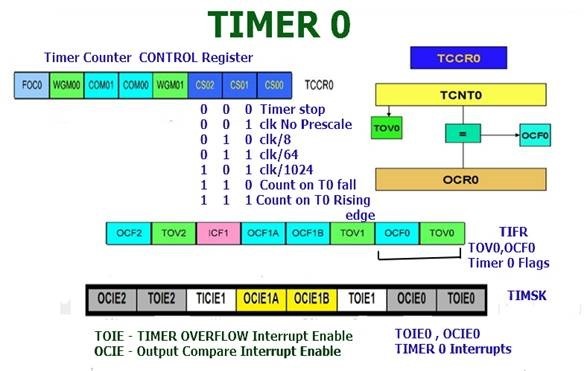 Set Timer OverFlow Interrupt TOIE0 bit of TIMSK register. 4. Enable global interrupt by sei () command. To start with we include the 2 Header files & then declare a variable count. Here we use the keyword Volatile , as the variable is a Global one & will be used inside the ISR Function.If you do not use the volatile keyword & use the variable within ISR , the AVR-GCC compiler may report error while optimizing the code. As we connect an LED at PD6 we make it as OUTPUT using left shift operator. We then initialize the TCNT0 & the count variable to 0. To set the prescaler as 1024 we need to set the bits CS00 & CS02 to 1inside the TCCR0 Register. which sets the I bit of SREG. Next we’ve to write the code for ISR Function. Let us see the calculation how we arrived at value 31 in the if condition. The clock is external crystal 8MHz.We apply a prescaler of 1024. So the counter TCNT0 has to overflow 31 times to generate A TIME DELAY OF 1 SEC. Make ALL from WINAVR’s Programmers Notepad to create HEX file & then click Program to upload the file.Now the LED at PD6 blinks exactly at 1 second interval. Clear Timer on Compare Match It is better to use instead of Normal mode because in CTC mode, frequency can be easily adjusted. When the Timer is triggered, register TCNT0 starts counting. 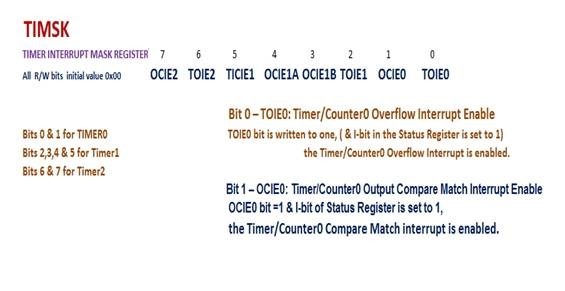 Timer0 has a OCR0 (Output Compare Register), which is continuously compared with TCNT0 register. In CTC mode whenever match occurs, OCF0 (Output Compare Flag) will set to 1. If continuous wave form generation is required, OCF0 must be reset again. Alternatively, if OCIE0 (Output Compare interrupt) and Global interrupt flags in SREG are set, OCF0 will reset automatically after interrupt execution. 1. Select CTC mode by programming WGM0 [1:0] bit. 4. 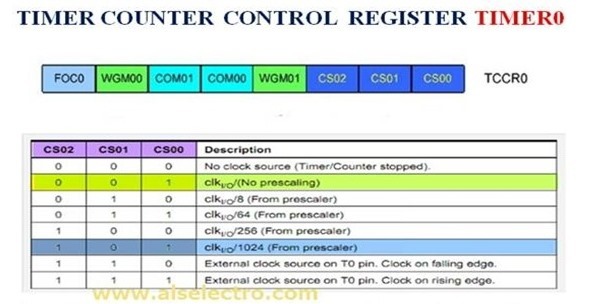 Set compare Interrupt OCIE0 bit of TIMSK register. 5. Enable global interrupt by sei () command. is set whenever a compare match occurs. It is cleared automatically whenever the corresponding ISR is executed. Alternatively it is cleared by writing ‘1’ to it. As the TIMER0 is 8 bit timer we can only load the counter with a value between 0 & 255 .This will not create a longer delay & the LED will blink fast , almost stable.In the next post we’ll see the TIMER1 capable of generating longer delay as TIMER1 is 16 bit . Compile the code as done in previous examples & see the LED blinking very fast , as we could generate delay in millisec only using Compare mode. 2. Program COM0 [1:0] bits and select “toggle OC0 if compare match”. 3. 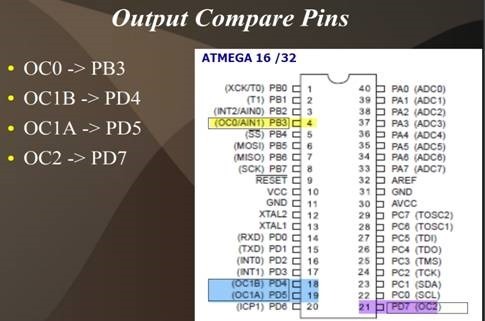 Set OC0 (PB3) pin as output pin. 4. Set OCIE0 bit of TIMSK register. 5. Enable global interrupt by “sei ()” command.